This page contains a character guide for Black Manta in Injustice 2. Here you’ll find movelists, combos, juggles, strategy guides and recommended gear for the DLC character. For more Injustice 2 content, head over to our Injustice 2 top page. The boy who would become Black Manta was an autistic youth who grew up in Baltimore, Maryland, and loved to play by the sea. As a youth he was kidnapped and forced to work on a ship for an unspecified amount of time. At one point he apparently saw Aquaman with his dolphin friends and tried to signal him for help but was not seen. Finally, he was forced to defend himself, killing one of his tormentors on the ship with a knife. Hating the emotionless sea (and Aquaman, who he saw as its representative), the boy was determined to become its master. As an adult, he designed a costume (primarily a black wetsuit with bug-eyed helmet that was able to shoot blasting rays from its eyes) and fashioned a high-tech submersible inspired by black manta rays. 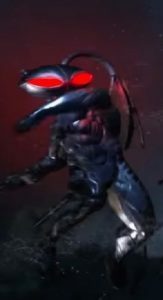 Taking the name Black Manta, he and his masked army became a force to be reckoned with, engaging in at least one clash with Aquaman prior to his first appearance as a rival to the Ocean Master. He also joined the short-lived Injustice League. Below are combo and juggle inputs for Black Manta , including corner strategies and restarts. Although this character was originally introduced during DC’s Earth-One era of publication, their existence following the events of the 1985–86 limited series Crisis on Infinite Earths remains intact. However, some elements of the character’s Pre-Crisis history may have been altered or removed for Post-Crisis New Earth continuity, and should be considered apocryphal. Black Manta only joined the Legion of Doom during the Flashpoint event.